A tutorial on how to implement the State design pattern in Flex 3. We are going to have a traffic light move through several states (red, orange, green). Of course there are other states the traffic light might be in, as well as transitional states (green and orange at the same time), but lets keep things simple! There are four approaches discussed here. 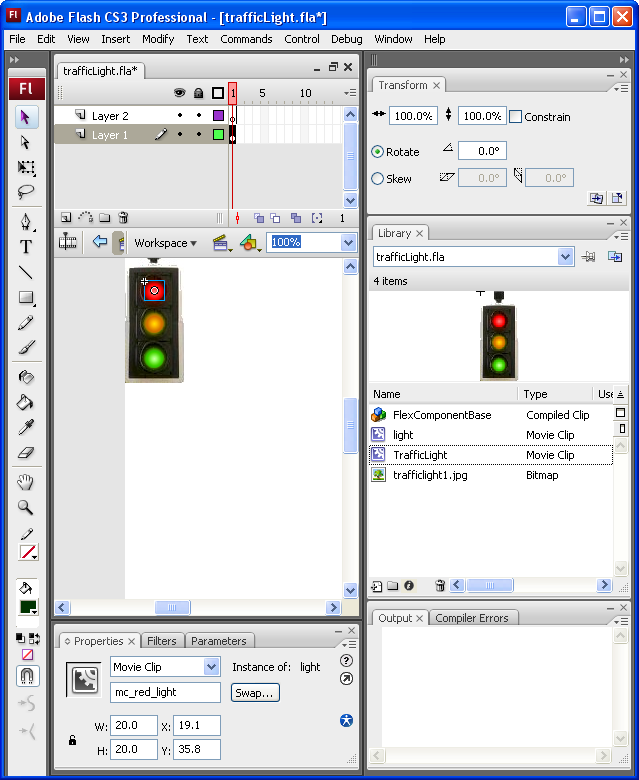 The first approach (version 1) uses flash for the graphics and flex for the logic. The second approach (version 2) uses two additional techniques within flex itself (no flash) to decouple graphics from logic. My thanks for Carl de Jager for his assistance in talking through these designs with me and helping to code them. Click on the above flash object - it is the result of our efforts! In our case the states will offer a Display() method and an EmitSound() method. Each concrete state will impement these differently. The client code only knows about the 'context' class on the left - it is up to the context class to track which state it is in by holding a reference to a concrete state instance, and switching to a different concrete state instance when the state changes. 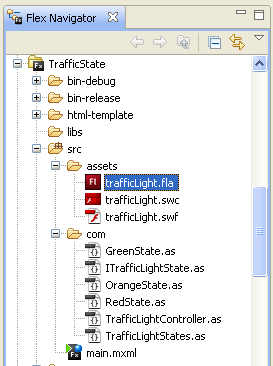 Client method calls (in our case Display() and EmitSound()) to the context class (in our case called TrafficLightController) are routed to the concrete state instance that happens to be there at the time, resulting in different behaviour depending on the state. Thus we do away with messy if then else logic and as a bonus can plug in future extra states easily without recoding any if else statements. So what we do in version 1 is to create both a Flex project and a Flash project. We leverage Flash's ability to create nice graphics and animations etc. and leave the logic for the superior Flex environment (actionscript 3, more modern architecture, IDE suited for serious OO programmers etc) to handle. Create a combined symbol named 'TrafficLight' containing the three lights and a background graphic. 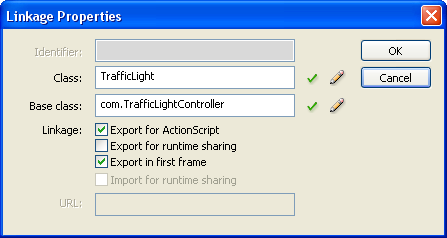 So that we can refer to the flash symbol from Flex ensure that the TrafficLight symbol in the Library is marked as inheriting from our custom Flex class com.TrafficLightController class (which we will create below, and which itself inherits from mx.flash.UIMovieClip). In Flash, you can right click on the symbol name in the Library pane to open the Linkage Properties dialog box to see this settings. We then need to include the flash trafficlight.swc as an asset in our flex project so that we can refer to it from our flex code. Now we switch over to Flex for the rest of the coding process. which dynamically looks up the graphic and hands it to the flex code which then sets the .visible property as needed. Ironically the code that drives the flash color changing lives in the TrafficLightController class, as a bunch of utility methods that the concrete state classes call upon. Note also that the EmitSound() method is not implemented in this project. Here is the UML of the solution. Note how the user drives the flex MXML form which holds a reference to the flash object. See how the flash object inherits from the TrafficLightController class thereby we auto-magically graft on smart behaviour to the dumb flash symbol. 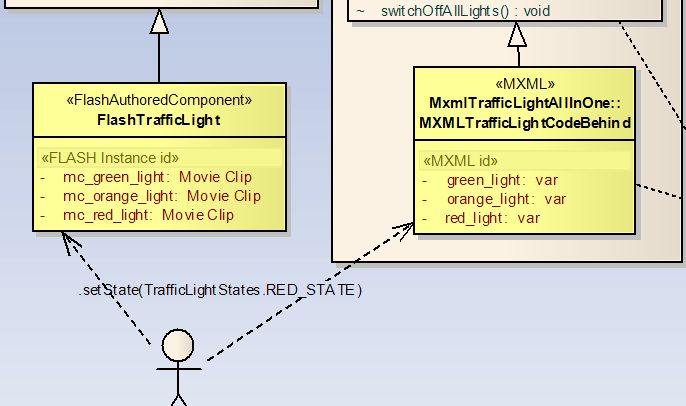 The TrafficLightControllerclass is the 'context' in our State design pattern and holds an instance of a state object. The states are singletons kept in an array, so that we don't have to keep creating and deleting state instances (this is a common implementation trick when implementing state pattern). Here is the resulting flash application - go on and click on the buttons! Why is the above UML so complex? Because we are trying to implement three different techniques in the one example, the UML gets complex. In all cases the state design pattern model logic is the same, which is good code reuse. We use adapters (another design pattern) to accommodate three different implementations within the one architecture, which itself is pretty cool. Note that the classes handling the graphics display (red/orange/green lights and associated buttons) are actually fairly lightweight, and indicated in dark yellow. The complexity is really in the "adapter" classes above them which house the code to implement the ITrafficView interface (allowing for our 3 variant implementations in the one architecture approach) and which allows the graphic classes to remain dumb and small. The benefit of this approach (besides learning about how to do the same thing in different ways within flex and thereby understanding flex better) is that we can change the graphic implementation at any time without changing our core business logic model, and our state design pattern (which resides in the model) also remains stable.